This window represents Christ calling the apostles at the Sea of Galilee. "The lower portraits depict Saint Peter and Saint Paul. Note that in the American-manufactured windows in this church, the faces and portraits are painted in oils onto the transparent glass. 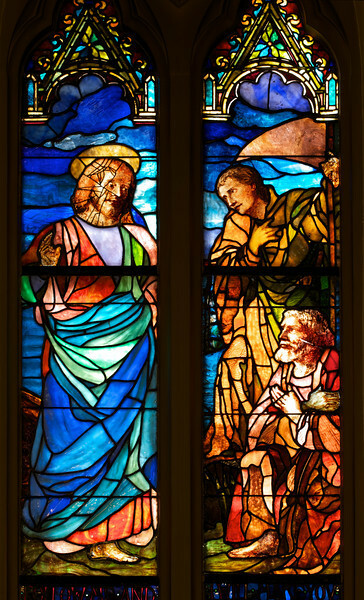 The English-manufactured windows in this church use an entirely different technique, where all aspects of the illustration are etched directly onto the colored glass and stained prior to assembly. The painted portraits have weathered over time, and are now protected from weather elements with a outer layer of plexiglass," according to the Incarnation website. LaFarge (1835-1910) was an American painter, muralist, and stained glass window maker. He was born in New York City. Initially intending to study law, he changed his mind after visiting Paris in 1856. He studied with Thomas Couture. Another of Couture’s students was Edouard Manet. See Couture’s frescoes of the Virgin Mary in my gallery on Saint-Eustache. According to to Wikipedia, LaFarge's earliest drawings and landscapes in Newport, Rhode Island (where he studied with painter William Morris Hunt) show originality, especially in the handling of color values. His first work in mural painting was in the Trinity Church in Boston in 1873. Aside from Saint Paul the Apostle, his other church works include the large altarpiece at the Church of the Ascension and Saint Paul’s Chapel at Columbia University. He created four great lunettes (a half-moon shaped space) representing the history of law at the Minnesota State Capital and a similar series based on the theme of Justice for the State Supreme Court building in Baltimore, Maryland. LaFarge received the Cross of the Legion of Honor from the French Government.